I really do love the city, and in particular its history. Before I moved here a year ago, the only history I knew was that connected with Robin Hood. Now, I'm beginning to understand so much more about Nottingham's social and political past. Every day I go out for a walk, and for the first time in years take notice of what's around me. Today I was walking back to the bus when I noticed The Thurland Hall public house on the corner of Thurland Street and Pelham Street, just off Old Market Square. I'd seen it before, but now men were working on its refurbishment and renovation. The hoarding outside drew attention to "this historic site". I decided to explore further when I got home. 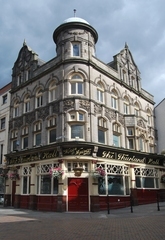 Before looking at the history, I decided to see what pub goers in Nottingham felt about The Thurland Hall. I could only see two reviews. One in May 2009 said, "OK if you don't mind being stabbed". The other in December 2008 just said, "Speechless". Make of that what you will. I can only hope that the renovation goes beyond the mere fabric of the building. One of the most prominent figures in the commercial, social and public life of Nottingham about the middle of the fifteenth century was Thomas Thurland, who built Thurland Hall. On completion, it was described as "the largest and most ancient mansion in Nottingham, second only in splendour to that of the castle". It's amazing to think that originally the house and grounds occupied about eight and three quarters acres. This is now Nottingham city centre. While there is fascinating political history, and royal connections with the Hall, what is of interest to me are the little bits of social history. It was at a meeting at Thurland Hall on the 4th March 1816 that the Bromley House Library scheme was floated. This moved to a 1752 town house in Angel Row in 1822, and is still operating as a subscription library, from the same premises to this day. More information on this can be found by logging on to http://www.bromleyhouse.org/ . One of the libraries past members was the genius scientist and mathematician, who is known as the father of quantum physics, George Green. He was a member from 1823-1833. He called Bromley House his first university, before going on to Cambridge in 1833. And all this from someone who was a miller by trade. Thurland Hall is mentioned as a place for public use, and it's wonderful to try and picture the uses made of the Hall, eg the card school pictured above from 1797. 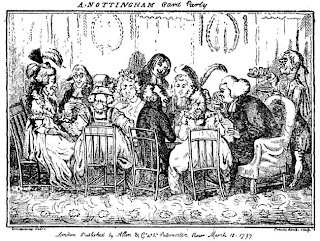 One history site throws light on the social life of Nottingham near the middle of the eighteenth century, and associates Thurland Hall with it. 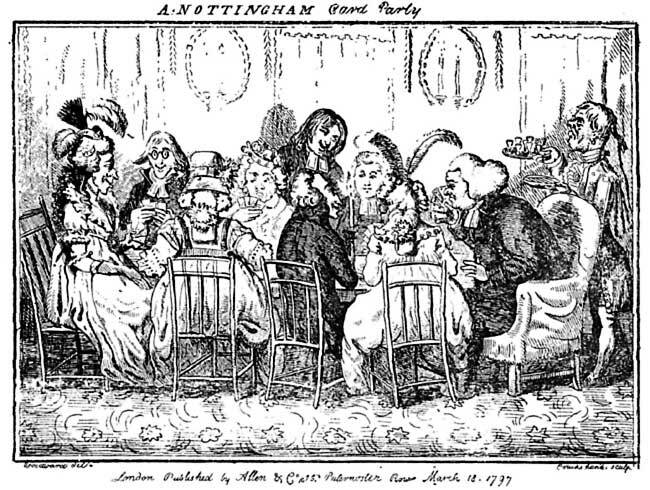 It says, "Two monthly assemblies contrived for the interview of the genteel part of the town of both sexes, where the younger divert themselves with dancing, whilst the senior or graver part enjoy themselves over a game of Quadrille or Whist. One of these places of meeting is on the Low Pavement. .... This is called the Ladies' Assembly. The other, called the Trademen's Assembly, is held in a large room 70 feet long and 20 feet broad, where the wealthy tradesmen, their wives and sons and daughters, meet for this same recreation. This is at Thurland Hall. The Tradesmen met every third Tuesday of the month, where in the evening there is a numerous appearance (a lot of people)". Apparently, during Assize week, election time and at the Horse races there was held some extraordinary Assemblies. It all sounds great fun, but only if you were wealthy. (There's my socialism coming to the fore again). Thurland Hall and the adjacent buildings were demolished in 1831. This is one of the reasons why I love Nottingham so much. It's full of history, and history can come alive. Hey dad - I love this blog as much as I love Nottingham too. The city is has so many layers - a place of legend and myth - in modern times this hasn't stopped - great blog!